A scene from the Bayeux tapestry - the Norman cavalry at the Battle of Hastings, 1066 AD. Bayeux, the old town. Parking. There is free unrestricted on-street parking away from the centre. The Parking areas indicated at the top of the map are Free. The parking area indicated closest to the Tapestry is a short-stay paid parking area (up to 3 hours). There is free parking on the boulevards Leclerc and Carnot, and near the station. As small French towns go, Bayeux is possibly the one with the best-known name. People worldwide, and particularly in Britain, have heard of the Bayeux Tapestry. This is the unique 11th century tapestry that depicts the preparation and the events of William the Conqueror's invasion of England, and victory over the Anglo-Saxons at the battle of Hastings in the year 1066. The tapestry, which is almost 70 metres long, was not actually made in Bayeux. Most historians believe that it was made in England, for Bishop Odo, William the Conqueror's half brother. Like most important Normans at the time, Odo had lands and power in both England and Normandy. Odo was Earl of Kent and regent of England, as well as being Bishop of Bayeux. Amazingly preserved for a tapestry that is over 900 years old, the Bayeux Tapestry has been in Bayeux ever since the late 11th century – a remarkable story for a long piece of linen cloth decorated with wool. The tapestry is displayed in a dedicated museum in Bayeux, but it is just one of the attractions of this small Norman town. Even before Roman times, there was a settlement on the west bank of the small river Aure, about 9 kilometres inland from the coast. The Romans stationed troops here and built up a walled city: Augustodurum, as Bayeux was then known, was one of the strongholds on or near the northern coast of mainland Europe, designed to protect Gaul from invasions or attack from seafaring Germanic invaders. The Roman ramparts survived in some form until the 18th century, and it was on the site of the Roman town that medieval Bayeux sprang up. What remained of the Gallo-Roman town was sacked in the year 890 AD, when marauding Vikings came down from Scandinavia. The Vikings conquered the local population and settled along this part of the north coast of Gaul, which became known as the land of the North Men, i.e. Normandy, the land of the Normans. 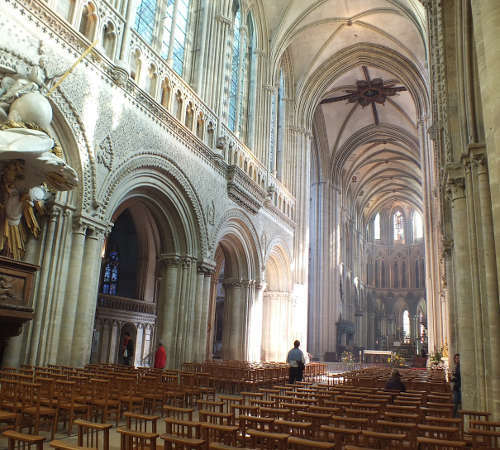 The Norman - gothic interior of Bayeux Cathedral. was at its greatest, in the 11th and 12th centuries, Bayeux was one of the most important cities in Normandy. The cathedral was consecrated in 1070, in the age of William the Conqueror. For the next 200 years, the city thrived, even after Normandy was absorbed into France in 1204, depriving the Angevins, who succeeded the Normans as kings of England, of their lands in northern France. During the Hundred Years War (1337 - 1453) the English Angevins tried to regain their historic lands in Northern France, and Bayeux was for a short time once more a possession of the king of England, Henry V. But in 1450, the town was taken by the French again, and has remained French ever since. For much of the time since then, Bayeux, with its cathedral and monasteries, has been a prosperous small city. Miraculously, the historic city came through the Second World War fairly unscathed, while nearby Caen was devastated; on 14th June 1944, Bayeux was the first French city to be liberated by Allied troops advancing south from the Normandy Beaches. Bayeux cathedral. The cathedral has been much extended and embellished since it was first consecrated in the year 1070. However, the massive Norman arches of the original building, with their geometric patterns, will look familiar to anyone who knows the great Norman cathedrals of England, such as Durham or Gloucester. The Bayeux Tapestry. The world's largest historic tapestry, sewn around the year 1070, and telling the story of the conquest of England by William the Conqueror, in 1066. The Baron Gérard Museum. Located in the historic former Bishop's Palace, Bayeux's main museum tells the history of Bayeux from prehistory to today. It has a substantial collection of historic porcelaine and lace, and art mostly from the 18th and 19th centuries, including works by Corot, Caillebotte and Philippe de Champaigne. The Battle of Normandy museum Museum dedicated to the story of the Normandy landings and the advance of Allied troops into France in 1944. The old town. The centre of historic Bayeux has many old houses, including medieval half-timbered houses and other historic buildings. Don't miss rue Saint Martin, rue Saint Jean, rue de Saint Malo and rue Franche; and discover the old waterwheels beside the river Aure (blue dots on the map). The British military cemetry - the largest Second-world-war British military cemetery in France, 4 km from the centre of Bayeux. Bayeux is the departure point for many guided tours of the Normandy Beaches. For guided tours check out at the Tourist Office. Alternatively, one can visit the many sites and memorials of the Normandy Beaches by car or by bicycle, at one's own speed. There are a large number of memorials and museums large and small on the coast between Utah Beach and Ouistreham. The map and the list below show some of the principal locations and sites to visit. The Normandy beaches and landings. The battery at Longues sur Mer. The only surviving gun-emplacement from the German Atlantic Wall sea defences - with 4 big guns still in place. Cherbourg 97 km to the northwest. The Cité de la Mer. Large maritime museum, including deep-sea diving, aquariums, and the Redoubtable, a decommissioned nuclear submarine. La Suisse Normande. Hilly country 60 km south of Bayeux. Hiking and outdoor activities. The highest point is Mont Pinson, altitude 345 metres or 1,132 ft.
By train Bayeux can be reached by direct train services from Paris Saint-Lazare station, in just over 2 hours; and from Cherbourg in just under an hour. Tickets can be bought online at Trainline.com . Region: Normandy - northwest France. Nearest airports: Caen, Rennes, Paris CDG. Main sites: Bayeux Tapestry museum, the Cathedral, the Baron-Gérard Museum, the Battle of Normandy museum . Nearby attractions and sites: The Normandy beaches, La Suisse Normande.. Luxury accommodation - rooms & apartments - in 18th century chateau close to Bayeux Tapestry museum. Free parking. ★★ Hotel Reine Mathilde Between the Cathedral and the tourist office. Well rated traditional two star hotel with restaurant & free parking.